The presidential primaries are in full swing, and as is the case with every election, money is a hot topic. In our last post, we showed how the Powerlytics Financial Health Index can be used to objectively assess business and consumer financial data and rank state economies. That was done with business and consumer data weighted equally. Now we’re going back to the data and adjusting the weights of business and consumer health before comparing it to campaign contributions. Why? To test the theory that states with wealthy individuals contribute more to political campaigns than states with healthy businesses and for-profit organizations. When weighted to emphasize business health, the list comes out almost identical to the equally-weighted results. However, when weighted to emphasize consumer health, state rankings shift dramatically and include many of the states we typically think of as wealthy. 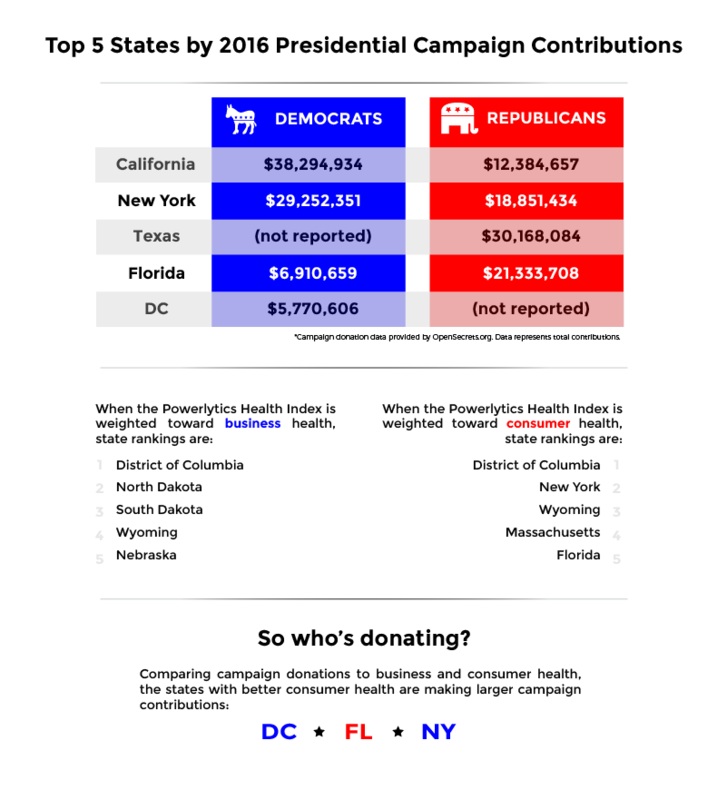 Comparing the two to a list of the states donating the most to 2016 presidential campaigns, we found the majority of campaign donations come from states with solid consumer health rankings – suggesting that the theory holds true that states with more personal wealth are more likely to try to influence elections.